B. Compatible Reporting Plugins Plugin Min. 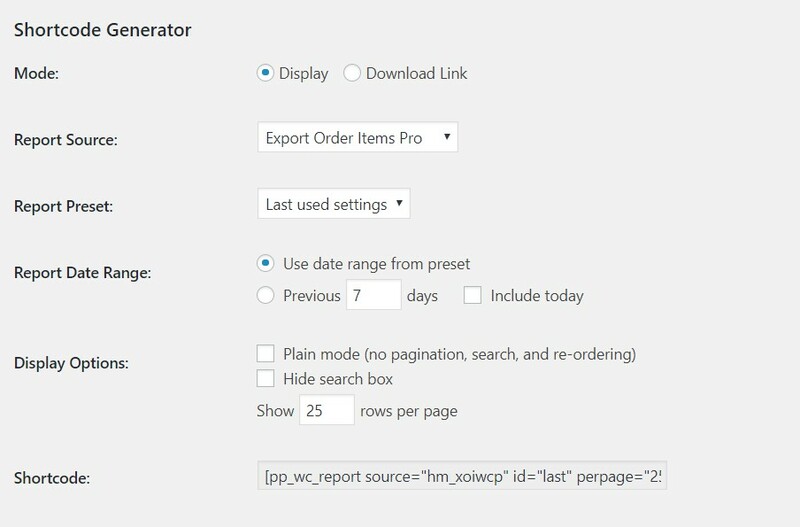 The Frontend Reports for WooCommerce add-on plugin allows you to provide frontend access to preset reports from compatible WooCommerce reporting plugins via a shortcode or widget. Currently, the plugin supports the Free and Pro versions of Product Sales Report and the Free and Pro versions of Export Order Items. 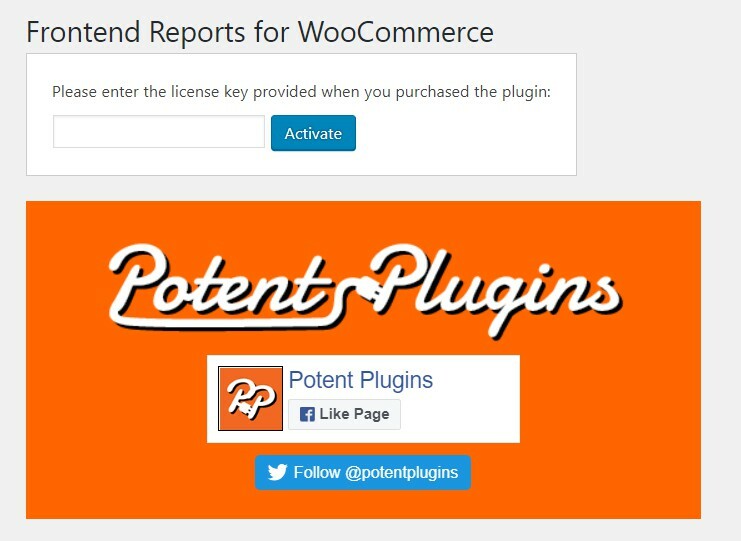 Thank you for purchasing the Frontend Reports for WooCommerce plugin. This brief manual will guide you through installing and using the plugin. 1. Login to your WordPress Admin and select “Plugins” > “Add New” in the left sidebar menu. 2. Click “Upload Plugin” at the top of the page. 3. Select the plugin ZIP file and click “Install Now”. 5. Select “WooCommerce” > “Frontend Reports” from the left sidebar menu. 6. Enter your license key, which was displayed after checkout and sent to you by email. The plugin is now installed and ready for use. Please note that you must also have the WooCommerce plugin and one or more compatible reporting plugins installed and activated in order for the Frontend Reports plugin to function. 1. 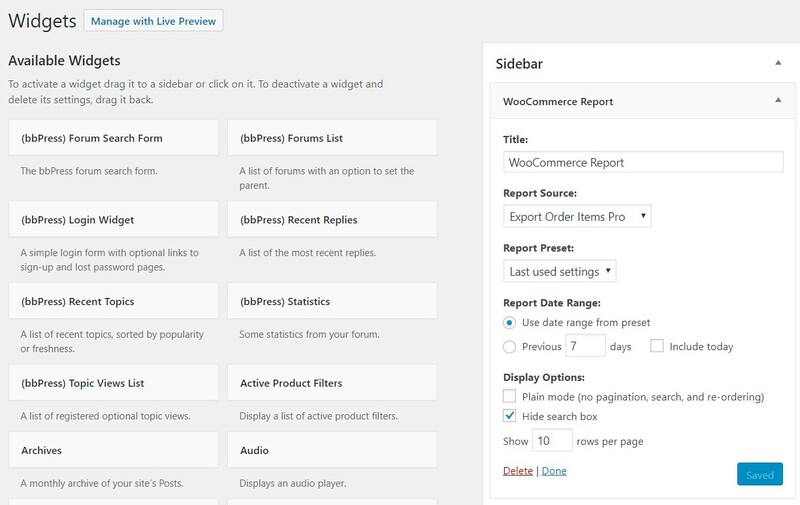 In your WordPress Admin, select “WooCommerce” > “Frontend Reports” from the left sidebar menu. ◦ Display: The report will be displayed as a table in the page body. ◦ Download Link: The shortcode will generate a link to download the report in the file format selected in the preset. Report Source: Select the plugin that will generate the report. Report Preset: Select the preset to use for the report (only applicable to plugins that support presets). Report Date Range: Enter the number of days of data to include in the report. ◦ Include today: By default, the report date range will end at the end of yesterday. If this is checked, the report date range will end at the end of today. ◦ Plain mode: If this is checked, the report will be displayed as an unformatted and non-interactive HTML table without pagination, search, or re-ordering capabilities. ◦ Hide search box: If this is checked, the search box will be hidden (only applicable when a plain mode is disabled). ◦ Show ___ rows per page: Enter the default number of rows to display on each page of the report (only applicable when a plain mode is disabled). Link Text: Enter the text to display in the download link (only available when Download mode is selected). 3. Copy the shortcode and paste it into the page or post where you would like the report to display. Keep in mind that anyone who has access to the page or post will be able to view the report, whether or not they are logged in. 1. In your WordPress Admin, select “Appearance” > “Widgets”. 2. Drag the “WooCommerce Report” widget to the sidebar where you would like it to display. Title: Enter a title for the widget. ◦ Plain mode: If this is checked, the report will be displayed as an unformatted and noninteractive HTML table without pagination, search, or re-ordering capabilities. If you require support for this product, please contact us at help@potentplugins.com. Support is available for one year from date of purchase. This plugin is licensed under the GNU General Public License version 2 or later (available at http://www.gnu.org/licenses/old-licenses/gpl-2.0.en.html). © 2018 Potent Plugins. All Rights Reserved.